Clean growth means growing our national income while cutting greenhouse gas emissions1. Achieving clean growth, while ensuring an affordable energy supply for businesses and consumers, is at the heart of the UK’s Industrial Strategy. It will increase our productivity, create good jobs, boost earning power for people right across the country, and help protect the climate and environment upon which we and future generations depend. Our strategy for clean growth starts from a position of strength. The UK was one of the first countries to recognise and act on the economic and security threats of climate change. The Climate Change Act, passed in 2008, committed the UK to reducing greenhouse gas emissions by at least 80% by 2050 when compared to 1990 levels, through a process of setting 5 year caps on greenhouse gas emissions termed ‘Carbon Budgets’. This approach has now been used as a model for action across the world, and is mirrored by the United Nations’ Paris Agreement. We have been among the most successful countries in the developed world in growing our economy while reducing emissions. 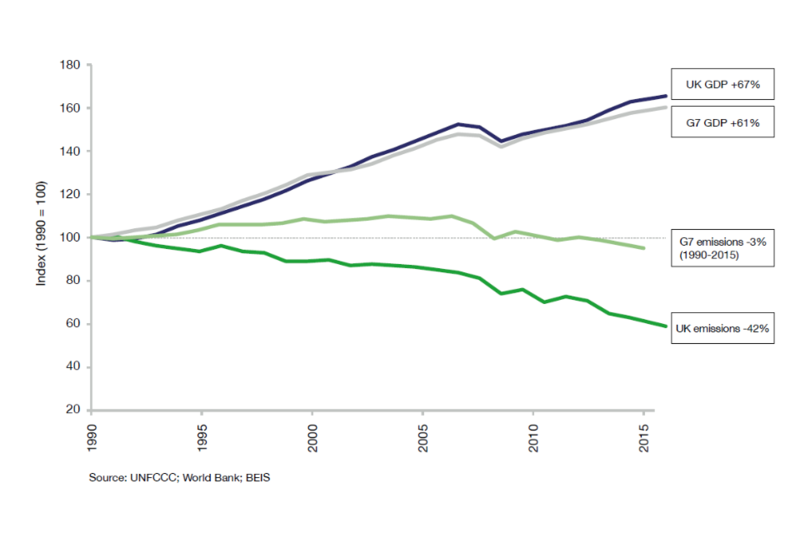 Since 1990, we have cut emissions by 42%2 while our economy has grown by two-thirds3. This means that we have reduced emissions faster than any other G7 nation, while leading the G7 group of countries in growth in national income over this period4. This progress has meant that we have outperformed the target emissions reductions of our first carbon budget (2008 to 2012) by 1%5 and we project that we will outperform against our second and third budgets, covering the years 2013 to 2022, by almost 5% and 4% respectively6. Our economy is expected to grow by 12% over that time7. This will be a significant achievement. We have made progress across every sector of our economy. 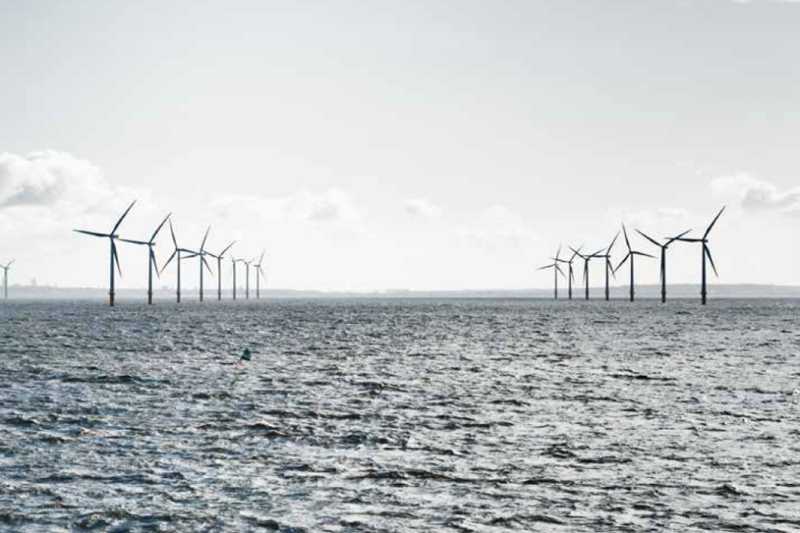 In 2016, 47% of our electricity came from low carbon sources, around double the level in 20109, and we now have the largest installed offshore wind capacity in the world. Our homes and commercial buildings have become more efficient in the way they use energy which helps to reduce emissions and also cut energy bills, for example average household energy consumption has fallen by 17% since 199010. Automotive engine technology has helped drive down emissions per kilometre driven by up to 16% and driving a new car bought in 2015 will save car owners up to £200 on their annual fuel bill, compared to a car bought new in 200011. England also recycles nearly 4 times more than it did in 200012. This progress has been aided by the falling costs of many low carbon technologies: renewable power sources like solar and wind are comparable in cost to coal and gas in many countries13; energy efficient light bulbs are over 80% cheaper today than in 201014; and the cost of electric vehicle battery packs has tumbled by over 70% in this time15. As a result of this technological innovation, new high value jobs, industries and companies have been created. And this is driving a new, technologically innovative, high growth and high value ‘low carbon’ sector of the UK economy. Not only are we rapidly decarbonising parts of the domestic economy, but thanks to our world leading expertise in technologies such as offshore wind, power electronics for low carbon vehicles and electric motors, and global leadership in green finance, we are successfully exporting goods and services around the world – for example, 1 in every 5 electric vehicles driven in Europe is made in the UK16. This progress now means there are more than 430,000 jobs in low carbon businesses and their supply chains, employing people in locations right across the country17. This progress has altered the way that we see many of the trade-offs between investing in low carbon technologies that help secure our future but that might incur costs today. It is clear that actions to cut our emissions can be a win-win: cutting consumer bills, driving economic growth, creating high value jobs and helping to improve our quality of life. Of course, greenhouse gas emissions are a global problem and action is needed from all countries. The UK has played a key role in demonstrating international leadership on tackling climate change through its domestic action, climate diplomacy and financial support. The UK was among the first to recognise climate change as an economic and political issue as opposed to solely an environmental one and has used its world leading economic, science and technical skills to shape the global debate around climate change, for instance making the economic case for climate action in the landmark Stern Report in 200618. The UK has also used its influence and resources to help developing countries with their own clean growth – and our actions to date are expected to save almost 500 million tonnes of carbon dioxide over the lifetime of the projects19, more than the entire annual emissions of France20. While we do not count these results against our domestic targets, we can be proud of the impact of the UK’s commitment to global climate action. The UK played a central role in securing the 2015 Paris Agreement in which, for the first time, 195 countries (representing over 90% of global economic activity21) agreed stretching national targets to keep the global temperature rise below 2 degrees. The actions and investments that will be needed to meet the Paris commitments will ensure the shift to clean growth will be at the forefront of policy and economic decisions made by governments and businesses in the coming decades. This creates enormous potential economic opportunity –– an estimated $13.5 trillion of public and private investment in the global energy sector alone will be required between 2015 and 2030 if the signatories to the Paris Agreement are to meet their national targets22. The decision by the US to withdraw from the Paris Agreement served to bring together and bolster action internationally on climate change with many countries underlining their commitment to the Paris Agreement in the days and weeks that followed. The UK is well placed to take advantage of this economic opportunity. Our early action on clean growth means that we have nurtured a broad range of low carbon industries, including some sectors in which we have world leading positions. 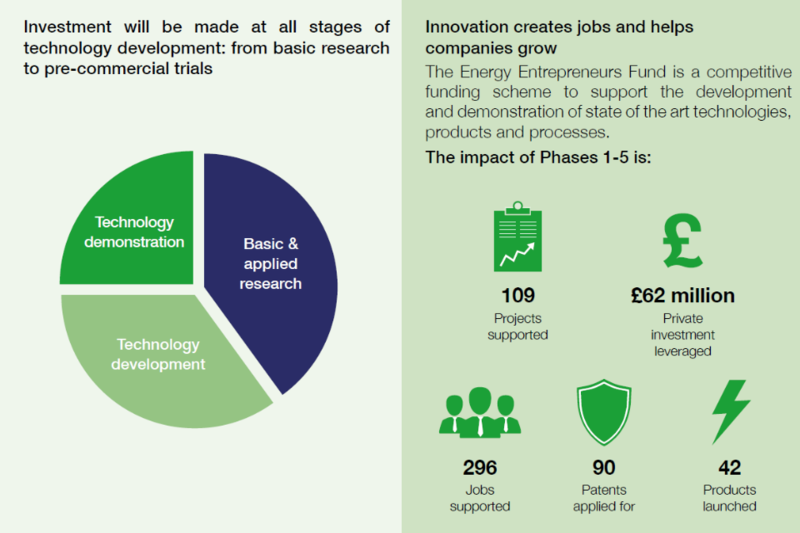 This success is built upon wider strengths – our scientific research base23, expertise in high-value service and financial industries24, and a regulatory framework that provides long-term direction and support for innovation and excellence in the design and manufacturing of leading edge technology. Capturing part of the global opportunity while continuing to drive down carbon emissions from our own activities could provide a real national economic boost. The UK low carbon economy could grow by an estimated 11% per year between 2015 and 2030 – 4 times faster than the rest of the economy25 – and could deliver between £60 billion and £170 billion of export sales of goods and services by 203026. This means that clean growth can play a central part in our Industrial Strategy – building on our strengths to drive economic growth and boost earning power across the country. Action to deliver clean growth can also have wider benefits. For example, the co-benefit of cutting transport emissions is cleaner air, which has an important effect on public health, the economy, and the environment. But hitting our carbon budgets and expanding the low carbon economy will not be easy. We have achieved significant results in the power and waste sectors and now need to replicate this success across the economy, particularly in the transport, business and industrial sectors. 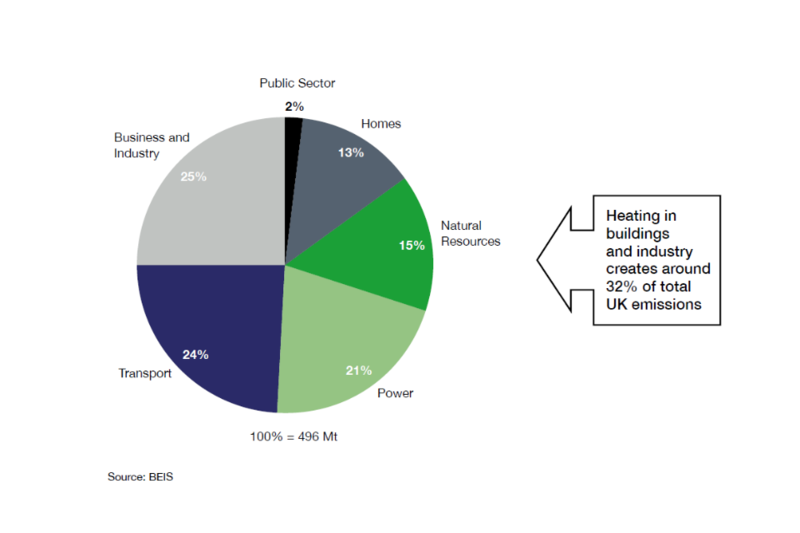 We also need to reduce the emissions created by heating our homes and businesses, which account for almost a third of UK emissions. If done in the right way, cutting emissions in these areas can benefit us all through reduced energy bills, which will help improve the UK’s productivity, and improved air quality, while the innovation and investment required to drive these emissions down can create more jobs and more export opportunities. In order to meet the fourth and fifth carbon budgets (covering the periods 2023 to 2027 and 2028 to 2032) we will need to drive a significant acceleration in the pace of decarbonisation and in this strategy we have set out stretching domestic policies that keep us on track to meet our carbon budgets. However, we are prepared to use the flexibilities available to us to meet carbon budgets, subject to the requirements set out in the Climate Change Act, if this presents better value for UK taxpayers, businesses and domestic consumers. Every action that we take to cut emissions must be done while ensuring our economy remains competitive. As we set out in our Industrial Strategy Green Paper, we attach great importance to making sure our energy is affordable28. This is why the government has commissioned an independent review into the cost of energy led by Professor Dieter Helm CBE. This review will recommend ways to deliver the government’s carbon targets and ensure security of supply at minimum cost to both industry and domestic consumers. Once ministers have had the opportunity to consider the review’s proposals, the government will incorporate its recommendations into the further development of the Clean Growth Strategy as appropriate. Another imminent challenge is to manage any impact of leaving the European Union as the government fulfils its commitment to the British people. Leaving the EU will not affect our statutory commitments under our own domestic Climate Change Act and indeed our domestic binding emissions reduction targets are more ambitious than those set by EU legislation. The exact nature of the UK’s future relationship with the EU and the long-term shape of our involvement in areas like the EU Emissions Trading System are still to be determined. There are also emerging opportunities to drive more action – for example by putting emission reductions and land stewardship at the heart of a post EU agricultural support policy. We will therefore carefully examine each area of common interest with our EU partners and work to deliver policies and programmes that are at least as beneficial as the current arrangements. This strategy sets out a comprehensive set of policies and proposals that aim to accelerate the pace of ‘clean growth’, i.e. deliver increased economic growth and decreased emissions. In order to meet these objectives, the UK will need to nurture low carbon technologies, processes and systems that are as cheap as possible. We need to do this for several reasons. First, we need to protect our businesses and households from high energy costs. Second, if we can develop low cost, low carbon technologies in the UK, we can secure the most industrial and economic advantage from the global transition to a low carbon economy. Third, if we want to see other countries, particularly developing countries, follow our example, we need low carbon technologies to be cheaper and to offer more value than high carbon ones. We cannot predict every technological breakthrough that will help us meet our targets. Instead, we must create the best possible environment for the private sector to innovate and invest. Our approach will maintain that of our Industrial Strategy: building on the UK’s strengths, improving productivity across the UK and ensuring we are the best place for innovators and new business to start up and grow. We are clear about the need to design competitive markets and smart regulation to support entrepreneurs and investors who will develop the new technologies at the scale we need. This will help our wider aim of improving the UK’s earning power. It is only through innovation – nurturing better products, processes and systems – that we will see the cost of clean technologies come down. 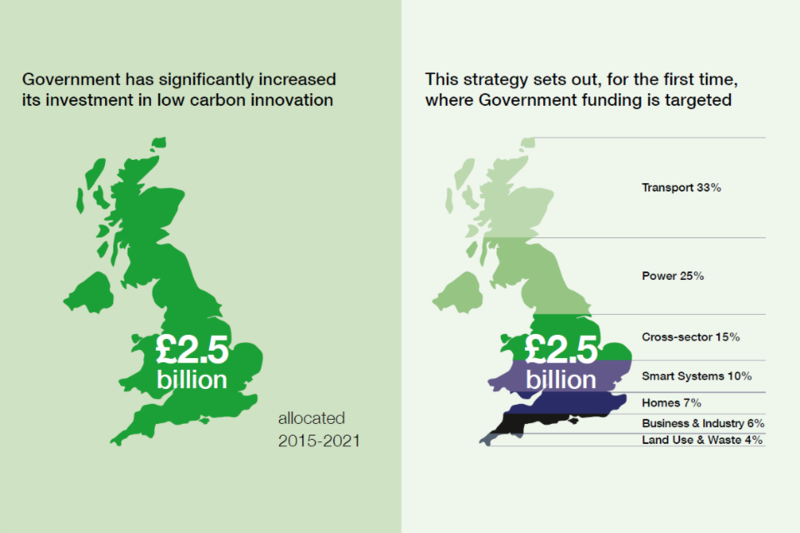 That is why this strategy sets out for the first time how over £2.5 billion will be invested by the government to support low carbon innovation from 2015 to 2021. More broadly, the National Productivity Investment Fund will provide an additional £4.7 billion, with an extra £2 billion a year by 2020 to 2021, representing the largest increase in public spending on UK science, research and innovation since 197929. The UK is also working collaboratively as a core member of ‘Mission Innovation’30, a group of leading countries which aims to drive forward clean energy innovation on a global scale. In addition to supporting innovation, we are focused on policies that deliver social and economic benefits beyond the imperative to reduce emissions. Higher quality, more energy efficient buildings are healthier places to live and work. Reducing the amount of heat we waste will reduce bills. Accelerating the rollout of low emission vehicles contains a triple win for the UK in terms of industrial opportunity, cleaner air and lower greenhouse gas emissions. And crucially, many of the actions in the Clean Growth Strategy will enhance the UK’s energy security by delivering a more diverse and reliable energy mix. Actions taken by the government on clean growth will be consistent with broader government priorities, such as delivering clean air. All parts of the UK have a major role to play in delivering our ambitions on clean growth, and the Devolved Administrations have a range of plans and policies in place to deliver emission reductions. We will work closely with them, and with local leaders across the UK, as we develop the policies and proposals set out in this strategy. The changes to our infrastructure and the pace of innovation will require significant investment from the private sector. The first steps to support the growth of the green finance sector in the UK are set out in this Strategy. We are building on a position of global leadership in finance and investment. These steps will be followed by ambitious policy proposals to further accelerate investments to deliver our Clean Growth Strategy. To help develop this longer-term work, the government has set up a new Green Finance Taskforce, comprising senior representatives from the finance industry and government. The key actions that this government will take as part of our strategy are set out below. While these policies and proposals will drive emissions down throughout the next decade, our focus is on the areas where we need to do more to achieve the fifth carbon budget through domestic action in the UK. Through preparing this strategy, we have identified areas where we will need to see the greatest progress, both through technological breakthroughs and large-scale deployment, if we are to meet the fifth carbon budget through domestic action. To achieve the clean growth we want, the UK will need to nurture low carbon technologies, processes and systems that are as cheap as possible. It is only through innovation that we will see new technologies developed and the cost of clean technologies come down. We want to deliver increased economic growth and reduced emissions. We have developed an Emissions Intensity Ratio (EIR) to measure our clean growth performance which we will publish each year so we can track progress. To reach our 2032 targets we will need to drive the emissions intensity of the economy down by an average of 5% per year to 2032, an acceleration in the 4% annual fall since 199031. This measures the amount of greenhouse gases (tonnes of carbon dioxide equivalent) produced for each unit of Gross Domestic Product (GDP) created. Currently the EIR is 270 tonnes/£ million and it was 720 tonnes/£ million in 1990. By 2032, we expect the EIR will need to be nearly as low as 100 tonnes/£ million to meet our ambitions. This strategy is not the end of the process. While this is an important milestone in our work to decarbonise the UK while growing our economy, our approach will develop and adapt to changing circumstances. We will update key elements of the strategy in line with our annual statutory responses to the Committee on Climate Change’s reports on progress, ahead of setting the sixth carbon budget by 30 June 2021. A full list of the actions and milestones arising from this strategy is set out at Annex B. Many of the future actions the government will be taking, expanding on the proposals above, will be set out in the 25 Year Environment Plan, which will be designed to be a sister document to this Strategy, and in a long term strategy for the UK’s transition to zero road vehicle emissions. Taken together, these set out the government’s approach to fulfilling its commitment to leave the environment in a better state than it inherited. Along with the Industrial Strategy White Paper, to be published later in 2017, these will form a critical part of our future progress. The government cannot achieve the changes needed to our economy by itself. Outside action on public sector emissions, the government’s key role is to set the framework for action across the economy. Beyond that, clean growth has to be a shared endeavour between government, business, civil society and the British people. Creating this supportive environment will help attract the domestic and international investment the UK wants. Therefore from 2018 we will work with private partners and NGOs to introduce a Green Great Britain Week. We welcome views and comments on our approach and these should be sent to CleanGrowthStrategy@beis.gov.uk by 31 December 2017. Views received in response to both this strategy and the detailed policy proposals which will follow it, will be considered as we update key elements of our strategy before setting the sixth carbon budget by 30 June 2021.